Having an effective marketing strategy in place to generate leads and align campaigns with your business goals, mission and vision ensures optimum returns out of your marketing budget. Before you start mulling over strategies, think about the answers to the five questions below. These are the 5 key points that will help you design and implement a highly effective marketing strategy. Know Your Customer – Develop clear personas for each group of your target customers. Know your customer, and understand their pain points. 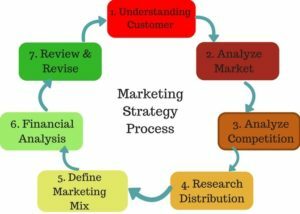 This will help you come up with marketing campaigns and strategies that highlight the benefits your product/service offers to them as a solution to their specific challenges. Market Research – Market research is needed to find out key metrics and data required for crafting a strategy. For example, you need to know the total available market, which geographical areas your target customers are located in, where they can be found online, market growth (historical numbers and projections) potential, latest market trends, etc. Competitor Analysis – Find out who your competition is, and what they are doing that you can do better. There are professional tools and techniques available for different aspects of competitor analysis. For example, you can use tools such as SEOProfiler to understand the online marketing strategies of your competitors. You can get a full list of all the keywords they are targeting, and then focus on them in your website to beat them at their own game. Similarly, you can do some mystery shopping to find out how each competitor tries to convert a lead into a sale. You can then incorporate the best parts of each competitor’s marketing and sales pitch and techniques into your own sales process. Distribution Channels – What is the best way to deliver your product or service to your target customers? This will impact your marketing strategy, so you need to know upfront what kind of distribution system works best in your business. Marketing Budget – Before you have a strategy in place, you need to know (roughly) what kind of marketing budget you have. When you do come up with a strategy, knowing the budget you have for it helps you evaluate key metrics such as projected marketing ROI, customer acquisition costs, lifetime value, etc. Marketing Automation – What kind of marketing automation tools and platforms do you have, or need? Any marketing strategy is only as good as the implementation, which depends heavily on the use of proper tools. For example, your social media marketing (SMM) strategy may be brilliant, but you don’t have the time to execute it at the scale you need. If you want to implement an SMM strategy that works and is scalable, you have to use tools like Hootsuite to manage, schedule and automate social media posts and responses. Similarly, you are going to need tools and experts to help you design and implement each aspect of your marketing strategy. Evoma helps new businesses grow by connecting you to in-house providers for everything from website design to digital marketing, sales and funding. Contact us now to grow your business.